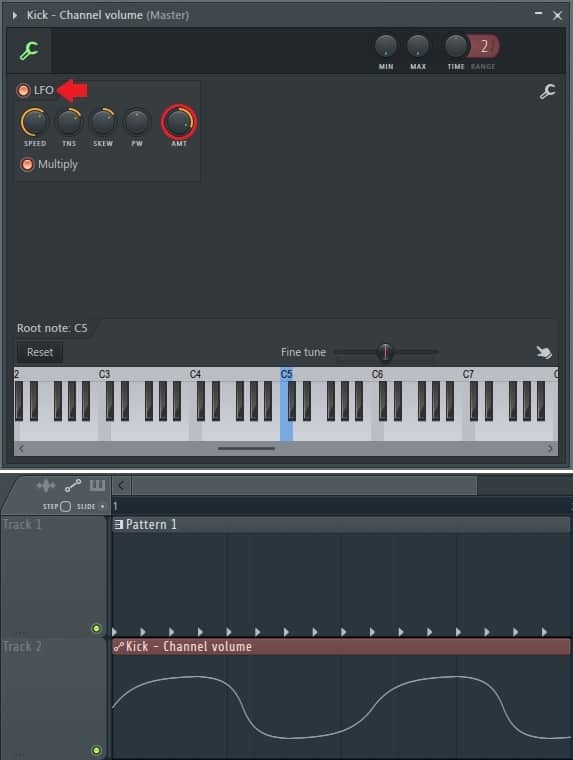 FL Studio automation can be achieved by a number of different methods. One way is by using an automation clip. 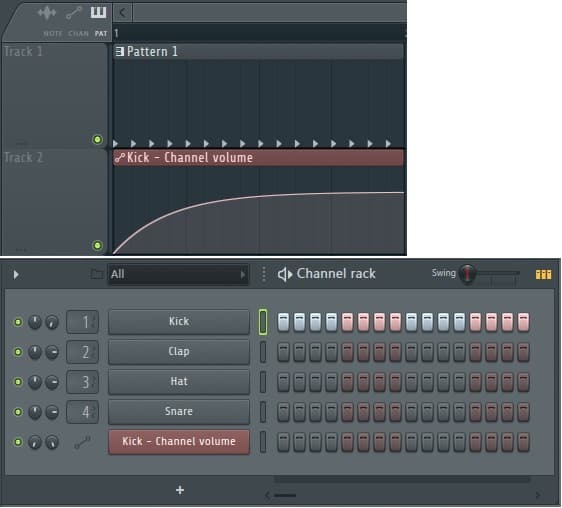 An automation clip (or envelope) can automatically control the behavior of a parameter or group of parameters in FL Studio. They are part of a larger group of features in FL Studio and many other DAWs that are formally known as internal controllers. This basically means they’re pieces of software code within FL Studio that can be linked to different buttons, sliders, knobs, etc. to vary the behavior of said button, slider, or knob, with time and without the user actively engaged. Let’s say you want your drums to slowly decrease in volume as an airy synth increases in volume. You could achieve this by creating an automation clip linked to the volume of each instrument channel or mixer track. It may sound confusing, but I promise after this, it’ll look simple. The best way to learn what these do is by seeing how they’re used. For this example, we’ll create and manipulate an automation clip for the channel volume of the default kick in the channel rack. The fastest and easiest way to make an automation clip is to open FL Studio and right-click on almost any knob or slider you can get your eyes on. A drop down menu will appear, and an option saying “Create automation clip” will become available. If you go over to your Playlist, you can see a flat default automation clip has been created and pasted there for you. Your channel rack will now also have a channel specifically made for the automation clip. We’ll mess with the Playlist clip first. So we’ve got the clip in the playlist, now what? First, if you hover over the clip in the playlist you can see a few thing happen. Three orbs will appear, one at each far end, and one in the dead center. The two orbs at the left and right represent the Kick channel volume level at the beginning (left side) and end (right side) of the clip. The middle orb is called “tension” which changes the shape or curvature of the line between two points. At default settings, as time progresses over the clip, the kick channel volume will remain constant since there is no change in vertical position between the left and right points. By clicking and dragging the end points, we can change their position, and this changes how the volume knob will behave over time. We can also create new points anywhere between the default start and end points by right-clicking inside the clip. Each of these new points can be clicked and dragged to wherever you want, and you’ll also notice that new tension points were created between each new pair of points. Right-click on a point and click “Delete” to get rid of it. There area a few ways to do this. If you right-click on any point, you will be presented with the options Copy value, Paste value, and Type in value… Copy and Paste is pretty self explanatory. Type in value… allows you to manually set the point to any value between 0 and 1, with 0 sending the point to the bottom of the clip and 1 sending the point to the top of the clip. When you click and drag tension points, they will change the shape of the line they’re located on. If you want a straight line again, just right-click on the tension point to reset it. Hold – maintains a straight horizontal line at the start value and then jumps up or down to the end value. Smooth – A simple smooth slide between points. The tension changes the amount of curvature near the end points of the line. Single curve – A parabolic curve between two points. The tension changes the amount of curvature. Single curve 2 – Another parabolic curve, but this one keeps the part of the curve that’s closer to the starting point straighter. It creates a boomerang-like shape. Single curve 3 – Another parabolic curve, with even more exaggerated curvature. When the tension on this one is at its maximum or minimum, it can be useful in eliminating pops and blips. Double curve 2 – Similar to Smooth and Double curve. But this one keeps the parts of the curve closest to the start and end points straight. Double curve 3 – Similar to the other Double curves but with very exaggerated curvature. When applied properly, this one can be used to get rid of popping and blips as well. Half sine – Technically, this is a quarter of a full cycle of a sine wave. The end point is the sine waves maximum, or amplitude. Tension adjusts the shape, with the max and min tensions making a true sine wave. Stairs – Evenly spaced step changes in the parameter in both time and level. Tension adjusts the number of stairs/steps between the start and end points. Smooth stairs – Same as Stairs, but… yea you guessed it, smooth. The corners of each step change have added curvature. Tension also works the same as in Stairs. Pulse – Evenly spaced and squared-off rises and drops in level. Tension adjusts the amount of pulses between points. This one is great for creating gates and fluttering effects. Wave – Either a sine wave or triangle wave between two points depending on how far tension is dragged to one side. Tension can change both the shape and the frequency of the wave. Back in our example, there are no kicks being triggered yet. We need to create a Pattern with a few kicks and slap it into the playlist just above the automation clip. I made a basic pattern in the Pattern 1 slot in the Step Sequencer. It’s got one kick on every step. Take a minute to experiment with the end points, shapes, and tension, and how each effects the volume of the kick as time progresses. Move the end points around a bit and click the play button or hit the space-bar to start it. Make sure FL Studio is in “Song mode” by toggling the button on your top toolbar (just to the left of the play button) off. You’ll even notice the knob itself will move as the time sweeper moves across the clip in the Playlist. Next, we’ll look at what we can do with the complementary automation clip channel created in the Channel rack. Click on it and it will bring up a new window shown below. TNS – this stands for tension. It’s similar to the tension from earlier. If you look at the max and min values of your LFO waveform, this changes the curvature of the lines between those points. PW – this stands for pulse width. When TNS is all the way up, this changes the width of your pulses. It also does some really weird things if TNS is at other settings. I always like to edit my automation clips with the Grid Snap set to “Line”. You can find Snap settings in the drop-down menu next to the magnet symbol on your main toolbar. It’s also next to the magnet at the top left of your Playlist window. It really helps to keep things clean and aligned. When an automation clip ends, it will hold the linked parameter at the end point value until specified otherwise. You can copy and paste automation clips in the playlist wherever you need them. Just remember if you change one, you changed all of the copies too. If you want a completely different clip, you have to either make a new one or click the icon a the top left of your playlist automation clip and select “Make unique” in the drop-down menu. To link any parameter to another parameter’s automation clip, just right-click > link to controller, and find the clip you want to link to in the internal controllers list. When moving control points, hold down SHIFT to keep the point at the same level. Be creative. There are so many things you can do with automation clips. You can link them to pitch, volume, panning, filter cutoff frequency, delay mix, the list goes on forever. Experiment with everything. One of my favorite things about producing music is just having a blast making crazy sounds. If you liked this 100% free FL Studio tutorial, let me know what else you’d like me to cover in the comments, on the Synaptic Sound Facebook page, or YouTube channel. And be sure to check out the complementary infographic! Very straight forward and informative. I would like to know if when working with legato instruments have a particular effect on stairs graph for example. Thanks. Hey! Thanks for the feedback. If I understand your question correctly, yes the “stairs” shape mode can be set to control parameters of plugins and arrangements that utilize legato. The instruments and arrangements you choose will not effect the automation clip settings, though. Hey. I don’t know how, but I how to change the “paint” in automation on a “hand’ ? Hey Michael. It sounds like you may have step editing turned on in the Playlist. To turn it off, you will need to look in the top left of the Playlist and change the playlist focus to automation clips. The button looks like two connected dots. Then, just below that, make sure the “Step” button is unchecked.